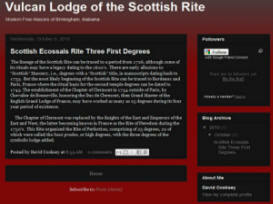 G. David Cooksey, the creator of this so-called lodge, is now dead. You can read about how GOOFUS (the so-called Grand Orient of the United States) has tried to use his death to feather their own nest by going to this page. Well before his demise, the "lodge" he created had passed into oblivion. The small handful of members have gone their separate ways, seeing each other only occasionally. From subsequent emails, the motivations behind those following Mr. Cooksey into his fantasy-land seem benign and almost justifiable. They wanted 'a better way' than regular/recognized Freemasonry they experienced in Birmingham, Alabama, without the racism they felt existed in the lodge there. Were there perceptions right? It's not for this site's author to judge. Suffice it to say that for some, we feel the motivations were valid though Quixotic. In looking back over Vulcan Lodge's creation and dissolution, it seems that anyone could have seen the logical outcome of all this. How did they think they could - with a half-dozen people - supplant Freemasonry? By imitating it? Wouldn't their time have been better spent putting aside the Masonic trappings and move to something else like Rotary, Lions, or any of a hundred local groups in their area which would offer what they perceived Freemasonry should have been? Obviously, for one person, it was all about ego however - and the result is something that will soon be forgotten, not even a footnote in Masonic history. This is not simply Monday-morning quarterbacking: it's a fact! You can rarely change an organization from the outside and if you can't change it internally, why continue to bang your head against a brick wall? So Vulcan has gone away - but the comments below stand as a testament to their foibles. Simply another counterfeit.... Flittering around the internet! One of the problems with (primarily Internet) groups that imitate Freemasonry is they change like a chameleon, often reinventing themselves within the blink of an eye. Open a web browser on Monday and they have one name, image, history and lineage. By Friday, it's something else entirely. For those who come to our section on FAKE MASONRY, our writing may seem confused or erratic when you've just viewed one of these counterfeit so-called 'Masonic' web sites simply because here we're addressing what was on their site a month (or even a week) earlier. Our links may lead you to think that we've referred to a completely different organization because, in the blink of an eye, these people aping Freemasonry have changed their personas yet again. The so-called Vulcan Lodge shows a perfect example of that 'confusion in the temple' - except that the confusion occurs on the web, in a public library or in someone's living room! In July, 2008 this page was rewritten in its entirety to, hopefully, make it more understandable but by year's end, they had done yet another chameleon change. Each time you visit here subsequently, you'll likely wonder just what we're talking about. (June, 2009 addition: they've gone thru FIVE - count 'em - FIVE different blogs and domains, including TWO in August, 2008 (more below), since then! See? Just like we said back in 2008! We're sure all of their loyal fans are keeping up, though: they reported "Readership is up!" Yep, those bots keep crawlin....) We apologize for the seeming incoherence: it's very difficult to keep up with their daily metamorphoses. "I am hoping to obtain all the degrees of Clermont and hopefully starting a new Supreme Council. These degrees would be given one at a time and not in a bundle in a one day class like the AASRSJ. I have done an indepth study and have found that the AASRSJ stole every degree they claim. It is time that the true Rite of Clermont flourish again in its true form." Vulcan Lodge was an 'Internet creation' springing from, seemingly, thin air. The 'guiding light' seems to have been a single erratic individual seeking attention and recognition. They had been holding meetings which were, through some internet digging and not disclosed on their own site, at the public library in Vestavia Hills, Alabama (Pop: 30,418). Subsequently their "Lodge" appeared to be in someone's living room. They were having "Table Lodges" which, most likely, were similar to the Starbucks rendezvous that the so-called Grand Orient of the United States became comically known for. The first appearance of this entity was in mentions of "The Temple of Regulus", touted - as most sham groups are - to be the greatest of all "Masonic" organizations. The 'Temple' became defunct, having been morphed by its creator into this group. More about these 'roots' below. 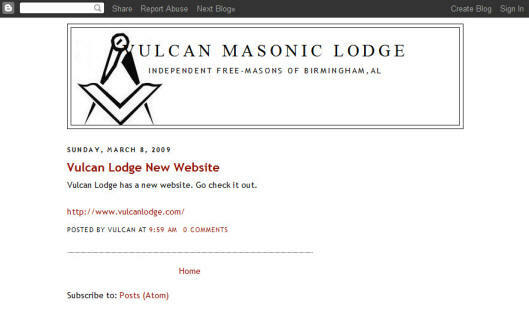 In 2007, they'd trumpeted their independence from any/all other Masonic (pseudo-Masonic, actually) bodies but in 2008, they advertised themselves as Vulcan Lodge #1, part of the so-called Grand Orient of the US (the group which has morphed from the so-called United Grand Lodge of America from which they'd resigned). As 2008 wound down, their apparent attempts at kissy-face makeup had failed but Mr. Cooksey continued to incessantly adulate the founder of the GOOFUS group at every opportunity. All this, though, is simply background. The point that someone seeking to join Freemasonry - especially Freemasonry in Birmingham, Alabama or the surrounding area - should take away from this is is that internet-pumped 'groups' are counterfeit and are, in fact, just a couple of people who are playing make-believe. They are NOT 'traditional Freemasonry' (or any variation of that phrase, including 'Modern Free-Masonry') even though they often claim to be. Their strongest tradition may be only a few weeks old and will easily be discarded on a whim if something is found to be more expedient (or, as seen in this case, with the demise of a single individual). Their brave claims about equality are simply hyperbole designed to play on an internet surfer's sympathy and gullibility. Do you REALLY think that the Masonic initiatory experience is conveyed in a room in a public library or by having every meeting at some local coffee store? (The library they used, incidentally, closed at 8PM on weeknights, 6pm on Saturday so those attending must not have wanted long and interesting degree work amongst dozens of new Brothers!) Their claims about 'upcoming degree work' were regularly "TBA" (to be announced - as shown below). Of course, if you're happy hooking up with a couple of people who have convinced themselves that they are Masons, getting your "degrees" as long as you're out of the library by closing time (or skipping that foolishness and just going out for a few 'brews'), and supporting a couple of internet bloggers financially and psychologically while the rest of the world laughs at the absurdity of it all, do enjoy! They're sure to tell you a good story but be sure to ask to meet a dozen members IN THE FLESH, see where they hold their ritual degree work and - most of all - look at their financial statements. We're willing to bet you'll get a song and dance (and a lot of excuses about how this site's author hates them or something - sheer foolishness! ): this should give you some clue that what we've written is fact. "Bro. David Cooksey is not affiilate with GOUSA or a GOUSA lodge. He resigned from its predecessor, GLofUSA more than a year ago." I have had no part in the forming of the GOUSA, I am not nor have been a part of GOUSA or a member. Nor do I now nor will I have any future connection with the GOUSA. I resigned as GS of the UGLA. I am an INDEPENDENT MASON AND SHALL REMAIN as such ONE PERIOD. Of course, in the real world, there's no such thing - but why let little facts like that stand in the way of a good rant, eh? If you're looking for the REAL Masonic organizations in Alabama and not something like this bunch of drama-seekers, we'd encourage you to head here or here. It was SO comical: could they have thrown in a few more adjectives to describe how they felt? Less than 12 hours later, their site was back in place as it had been before with no chance at all, really, to enjoy the silence! Moving on to August, 2008, blog posts were modified/edited as their falsehoods/errors were noted on several (real!) Masonic discussion lists. They were also several other issues and problems as is apparent from this comparison of blog posts. Should you become involved with this group, you might want to ask about what happened to David C., Davied, Alan, and David K.? Claiming at first 7 officers and yet 90 days later claiming only three would seem to indicate that 57% of their 'membership' figured out they'd been, to use a Masonic phrase, hoodwinked! Their 'surviving' members (or at least the NAMES of their surviving members) will pop up on a blog comment section or in some unregulated forum bragging about how their group doesn't suffer the same 'problems' as regular/recognized Freemasonry. It's all in 'the tale of the tape', folks. Decide for yourself.  On their blog of October 13, 2008 there was a wonderful picture of --- what is that anyway? Is that THEIR LODGE? 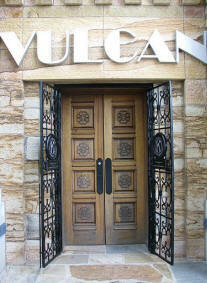 It had, after all, the name "Vulcan" over it. The post, titled "Welcome" would seem to imply that it's where they meet, wouldn't you think? Of course, if you look closely you'll see that those emblems on the grate doors are that of the Kiwanis and a bit of digging around the Vulcan Monument website that it's really the Linn-Henly Gallery there. You can compare the (identical) doors at this link. (*See next paragraph) Now the Vulcanites will whine that they're being unduly persecuted and that they'd NEVER intended to create the impression that this was THEIR location but it does seem particularly strange that they didn't mention that in their 'welcome', eh? Perhaps they would have been better putting a hand-drawn napkin in the center of the table where they meet at the library. And despite the rants from Mr. Cooksey, their page did NOT identify the picture as coming from the Vulcan Monument as he now states. It was there to deceive! Update 10/29/08: Comically, barely 24 hours after we posted the paragraph above, their proud proclamation about "...a true Masonic meaning and Brotherhood...." was changed. Gone too was the misleading photo, replaced by an innocuous picture of the Vulcan statue. To us, this 'shuck and jive' once again showed what you're getting into if you chose to do so. If you think this is what Freemasonry and Brotherhood is all about, you are VERY sadly deluded! REAL Masonic Lodges don't do things like this, folks. On Saturday April 19, 2008 history was made in Birmingham, Al. For the first time ever Black and White Masons met on the level and breeched the color line.Because the Alabama the Grand Lodge doesn't recognize Prince Hall.Venerable Master Jamie Peffer and Senior Warden David Cooksey of VulcanLodge attended lodge with the Brethren of the Sons of Light Lodge No.3. For the first time ever Black and White Masons met on the level and breached the color line. Worshipful Master Ian Jackson personally invited all Vulcan Lodge members to attend their regular communication and Vulcan Lodge accepted. The Sons of Light No. 3 is a Progressive Free & Accepted Mason lodge affiliated with PHA but not a member of PHA. All present had a wonderful time. What a joy it was to be in lodge with brethren who are thirsty for Masonic knowledge! They have invited us back and we have, in turn, extended an invitation for them to take part in some of our upcoming activities. Pictured is Jamie Peffer Venerable Master of Vulcan Lodge. And we're glad they were excited to be with "...brethren who are thirsty for Masonic knowledge!" Does this mean that they've got no one like that in their Vulcan lodge? Or perhaps, since both organizations are simply playing make-believe, they want to learn about the 'real thing'? Also, as we noted when we'd added their story to this site originally, "affiliated with PHA but not a member of PHA" is just more 'shuck and jive'. At the time, there were comments made to various Masonic discussion venues asserting that my remarks here were racist. Perhaps the individual making such charges would care to complain to the MWPHGL of Massachusetts where I've held membership in African Lodge #459 for more than a decade? (Talk is cheap, boys! You visited a meeting with black men. Wow! What a big deal. You obviously think this is something special. For some of us, living racial equality is just an everyday part of our lives and nothing noticeable or out of the ordinary.) And one would wonder why a Grand Lodge would make me their representative to a MWPHGL if, in fact, the charge of racism had even the slightest shred of truth. The Vulcanites want to make a big deal out of a visit with a couple of people from another race: bully for them. However, the regular MW Prince Hall Grand Lodge of Alabama would have nothing to do with EITHER the Vulcans OR the Sons of Light! Working on pages involving counterfeit Freemasonry (or, as these kiddies like to call it, "Free-Masonry") really and truly gets to be funny. Belly-laughable funny, in fact. In November, 2008, the Vulcanites - exhibiting what they apparently thought was 'Masonic behavior - chose to publish all sorts of personal information about me on their blog. It's something that one might expect from the anti-Masonic crowd but apparently those involved in this 'Vulcan Lodge' feel that such behavior is appropriate for them too. Sure, they feel badly that their little charade had been exposed to the light of day but is putting an individual's personal information (address, phone, etc.) on the web for all to search an appropriate reaction? What happens if YOU fall out of grace with them? Will they then throw flaming paper bags filled with do-do on your porch or something? That's the way it is with counterfeits, though: they moan and groan when facts are presented but rather than address them forthrightly, they respond with personal attacks on the individual, complete with horrid spelling and bad syntax! Just watch them: you'll see. A few days later they decided to provide the waiting world with a picture of what they described as their "elegant lodge" including pictures showing their officers. Of course, there were only two people in each of the pictures/posts. Could it be they only know how to upload one picture at a time? Or, more likely, were there only three people to photograph? The pictures were in an A-B, B-C, A-C fashion. Somebody, after all, had to hold the camera. (Probably not technically advanced enough to know how to use the delay feature on most cameras and smartphones today....) Of course, the second picture has now been removed from their site but we've got a page capture if anyone wishes to see it. Moreover, though, we thought that the pictures of the officers really did look more like they were standing in someone's front parlor than in a lodge room. Despite the fancy gilt frame, the picture of Cherubs: Sculpture by Swiss prodigy Angelica Kauffmann (1741-1807) is certainly not the original. You can get your own copy for $12.99 online. Beyond that, though, what kind of a lodge room has the Master's chair blocking a gorgeous fireplace? An "elegant lodge" (as they pretend to be)? Oh, but then there was the other thing that caught our eye: take a close look in the far right of their picture. 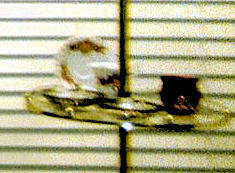 What is that on the lamp-table (of the kind that one finds in a house but not a lodge room)? Why it's a - hold on for this - TEA CUP! Yes, indeed: a tea cup and saucer in a little display stand. Looks like a cute little jam jar or creamer there too. And there's more than just tea cups. Here's a cute box that you'll see as they describe their "Master's Station". Over to the left of the Bible there's a small box with three intertwined rings: the three rings of the International Order of Odd Fellows, the letters for which you see on the top of the box. They apparently grab stuff even from unrelated organizations to 'prove' that they're Masonic. 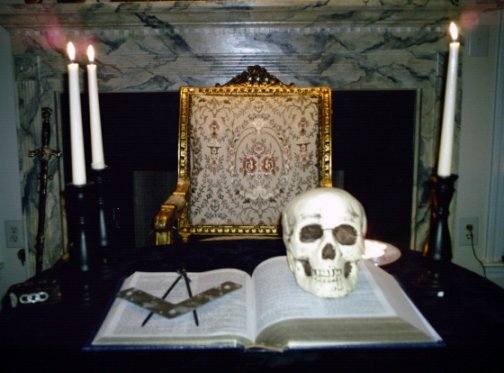 The skull likely came from the Odd Fellows as well: they use it as an emblem of immortality in their degrees! As you read on the web about "Traditional Cosmopolitan Freemasonry" (or "Traditional Cosmopolitan Free-Masonry"), remember that this is an example of it! If you contribute money or time, you should plan that your efforts will be thrown into the dust bin of history within a few months and you should know that you'll NEVER be welcome in the world-wide fraternity of several millions of Masons. Enjoy! Wow! That sounds SO cool, doesn't it? Sounds like it would be something really worthwhile. In fact, though, it's a cobbled and confused history of stuff that everybody things they've got the 'real deal' of but which nobody can prove. The actual Rite of Clermont existed from ~1754 until ~1763. You can read all sorts of theories and suppositions about who did what when but nearly every Masonic researcher contradicts every other on the details of this - so it's highly unlikely that someone who has ZERO credentials in Masonic scholarship/research has found something that's correct. Beyond that, if these degrees were so darn good and meaningful, why aren't they in use today? Well, dear friends, it's because they WEREN'T - even though somebody may be massaging them in the back room so that you'll think so. There's a long and difficult post here which fairly accurately summarizes the twists, turns, and theories of this particular Rite, one of hundreds that existed on the Continent at this time. Above we mention the constantly changing blog sites (not to mention their aberrations like the 'total silence' shown above) but in their fifth incarnation (May, 2009), they decided to go 'whole hog' in the field of deception. Publishing - as other 'counterfeit groups' do various essays from REAL Masons. Like all of the fakes and phonies, they post works published by (dead) regular/recognized Freemasons, ignoring copyright if applicable, and making it seem as if these people were somehow supportive of the Vulcan Lodge and/or its ideals. Nothing could be further from the truth and those men would certainly roll over in their graves if they could know how their labor of love is being bastardized. The essays will, perhaps, draw at least one or two curious eyes to their blog site du jour while simultaneously creating an aura of realism since the topics carefully chosen have been controversial, at least at the outset. Like all houses built on sand, though, we suspect this too will collapse after a VERY short while (they've not been able to keep any of their four prior attempts going consistently for more than a couple of months) so there'll be some other bit of shuck and jive attempted in the not-too-distant future, we're sure. Of course, there may be a simpler solution: the kiddies are just learning about technology and thus, their need to create (soon a half-dozen?) sites and then abandon them for something else. We know, in fact, that one of their 3-4 members, who claims to NOT be a member, hasn't a clue as to what the sound of a fax machine is when he reaches one on the telephone. He thinks - hold on for this one! - that it's someone blowing a whistle into the phone at him. AMAZING!! I sure wish I had lungs that could keep a whistle going for several minutes without a single fluctuation. Why he even posted about it on his blog in 2008. The web designer Reverend writes "...anyone can file a DMCA request....". I had mentioned before he'd written his reply that these were DEAD authors but perhaps his religious position permits him to know that the dead can file such things from their internet terminal on high if they really want to. Even better was this: "Copyright laws as you should know has <sic> provisions for reproduction for the explicit purpose of discussion and debate( fell <sic> free to comment on our site at the end of any post Mr. Ed)." (I've always found it comical that these guys whine about not getting any the proper respect and then use these puerile insults like "Mr. Ed" or "Burger King" and can't spell properly. Speaks really highly of 'the Reverend' and his personal/religious values, doesn't it? Perhaps this "Reverend", being so knowledgeable on copyright matters, will cite the particular part of copyright law where this is allowed? And, this being the case, perhaps he'll want post several chapters of The Lost Symbol on their site for discussion, eh? After all, it would be "...for the explicit purpose of discussion and debate...." Rest assured we'll FEEL (not fell) free to comment more about this stupidity so you can truly enjoy their antics. Just a couple of hours later, the Vulcan immediate Past Venerable Master, Mr. Cooksey (I chuckle about that title, used to differentiate 'them' from 'us') writes "Loved ones? Yeah right. He is just a miserable, lonely, old b@stard." It's typical: do as I say, don't do as I do - a behavior pseudo-Masons have honed to a fine edge. They, and you dear reader, can be assured that my life is full and rich, without the need to run from pillar to post on the internet, hiding behind lots of secret identities to whine and cry about how very awful Ed and his site are. And don't worry: I'm not at ALL in ANY trouble with ANY REAL Grand Lodge despite the blowhard claims these kiddies make. It's absolutely hysterical to even contemplate such a thing! G. David Cooksey is now dead. You can read about how GOOFUS (the so-called Grand Orient of the United States) has tried to use his death to feather their own nest by going to this page. Well before his demise, the "lodge" he created had passed into oblivion. I understand that the small handful of members has gone their separate ways, seeing each other only occasionally. There's no ill-will on my part towards anyone involved in the creation and deception pursued by the so-called 'Vulcan Lodge'. That those involved turned a blind-eye to the farce Cooksey was perpetrating is sad but is something they, not I, must carry with them. If they learn life-lessons from this which will help them grow as men, it was probably worth it. Sadly, though, it may well have turned off some to what they could have done with their time and talents. In at least one case, the details of which are private, I know that contact with Mr. Cooksey brought about joy and happiness, albeit indirectly. It is likely the desire of every member of the human race to make a difference in the world and in that small way, Cooksey did. The rest of this foolishness, however, is best forgotten! Completely revised August 2, 2008 and updated August 25, 2008, October 17, 2008, October 29, 2008, January 29, 2009, February 11, 2009, May 25, 2009, July 8, 2009, July 15, 2009, May 31, 2010, August 1, 2010, November 15, 2010, December 22, 2010 and January 21, 2011. Finalized (I think) on October 6, 2012.